As consumers become more aware of daily chemical exposures in their homes, small mattress companies are filling the new demand. But confusing and misleading sales strategies common in the industry have trickled over into the natural and organic mattress market as well. With the help of industry insider Mr. Wilson, owner and CEO of Mattresses and More in Florida, this article will teach you what you need to know to buy safe mattresses for your whole family. But Birnbaum and Heather Stapleton, a Duke University chemist who studies flame retardants, questioned whether any foam product can be sealed completely. They said chemicals escape when they vaporize and seep through seams or holes and get into air and dust. And Inez Tenenbaum, chairman of the U.S. Consumer Product Safety Commission, stressed that she sees no need for flame retardants in children’s mattresses, which can be protected with inherently flame-resistant wraps or barriers. To fight a fire means confronting a toxic soup of burning chemicals and their byproducts, including dioxins, furans and formaldehyde. Many of the most toxic fumes released by today’s fires actually come from chemicals added to everything from clothes to couches to computers in an effort to retard flames. But, as an investigation by the Chicago Tribune uncovered, those additives may offer no meaningful fire protection. Foam mattresses including memory foam and polyurethane foam, are the most toxic of all mattress materials. It can off-gas VOC’s for the life of the mattress, causing little to no obvious discomfort to some and a small percentage of individuals experience respiratory irritation, headaches, and nausea. Long-term exposure of VOCs are linked to central nervous system damage, organ damage, and cancer. Also used in making the foam are PBDE‘s, Formaldehyde (one of the most dangerous commonly used substances in use in US manufacturing), methylene chloride (a potential carcinogen), Phthlalates, and CFC’s. Conventional Cotton is sprayed with more pesticides than any other crop in America. As one of the top four GMO crops, it is also extremely damaging to the environment. He did discover some smaller companies aimed at natural and organic mattress sales, but he ran into a second roadblock… terminology. This was nothing new to the seasoned mattress store retailer, but it is all Greek to the average consumer. One common trick borrowed from the food industry is to claim a single “100% organic” ingredient, but failing to mention that they added other non-organic ingredients during the process. The claim that the mattress is “made with 100% organic cotton” would be true, but does not mean the rest of the mattress is made without chemicals. The same applies with latex mattresses. Some companies use “fillers” to create a latex-chemical blend and decrease the costs (Dunlop and Talaylay excluded). And, “flame retardant free” does not mean it’s free of other chemicals, or additives. This goes as far as what kind of glue they use. There are two ways to meet flammability requirements without chemicals, and that’s by using wool or latex, as both are naturally flame retardant. 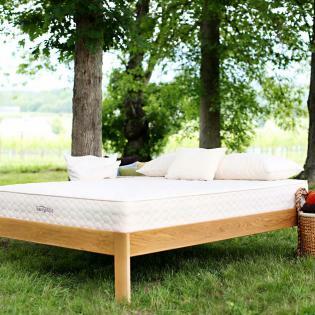 So if you’re in the market to buy an organic mattress, you’re looking at two options, a spring coil mattress or latex mattress. Spring coil is a great option for a child, for someone needing a firmer bed, or if you are choosing to use a wool or latex mattress topper. Latex mattresses are the best in customer satisfaction and even makes competition tough for the super comfy memory foam everyone is talking about (great comparison here). fine if you’re a back sleeper and prefer a firmer feel; however, studies show a top layer of talalay latex does a better job of relieving trigger points in your hips and shoulders, especially if you’re a side sleeper. 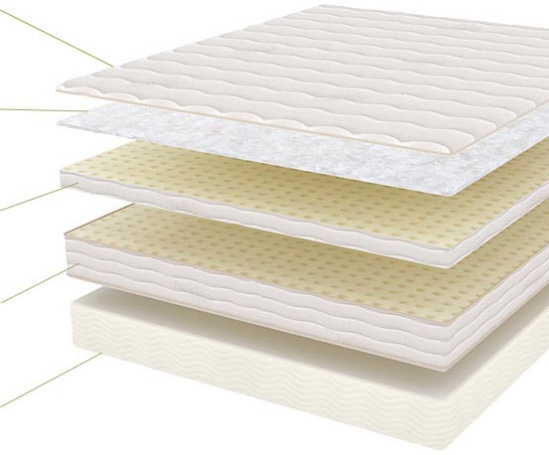 The optimal latex mattress design would be a 100% natural dunlop core, which is denser to prevent sagging, with a 100% natural talalay top layer for better pressure relief. Mattress stores hire salesmen on a base salary plus commission, usually 8- 10%, and they often have weekly quotas to meet as well. The advice of our insider is to be wary and take your time. Discuss the beds, take detailed notes, then go home and research everything he said. A good salesman will give you good information that can be verified online when you get home. Any time a salesman pressures you with a time crunch or inventory (“our last one!”), that’s a great time to walk out. Three things you can ignore: the warranty, and the sale. For the most part you can disregard the manufacturer’s warranty and stores don’t offer their own. Due to the strict requirements and the quality of the beds, the warranty is a gimmick that is almost never needed, or honored, by major manufacturers. One dirt scuff or half a cup of water spilled on it and the warranty is voided, so don’t let the warranty factor into your decision. As for the sales, mattress stores are all expected to have big sales. However, the savvy buyer doesn’t need a sale because you know to get the price you want, you just ask for it. All mattress stores will meet or beat the competitor’s lowest price so it doesn’t matter whether the mattress is on “sale” or not. Mattress stores mark up their mattresses about twice the price, with some chain stores marking them up to 3x the wholesale price. So there’s some good wiggle room for bargaining up to 50% on the average mattress. With natural and organic brands, you can negotiate down 20- 30% off the price tag. However, some manufacturers have a contract that the retailer not go below a certain price. If this is the case, you may still be able to negotiate for free delivery, sheets, pillows, or mattress covers. Note: sales tactics do not apply to buying directly from the manufacturer. Life. The life of your mattress is primarily dependent on the kind of mattress you buy. A spring coil mattress from a good company and average use should last you 5 – 10 years (Consumer Reports averages 8 years), and latex will last you 10- 15 years (many will last 20 years). With perfect use, they can last much longer, but that is assuming you turn the bed as suggested every few months, don’t use the side of the bed as a seat, and don’t have kids jumping on it. Transport. Latex mattresses are extremely heavy, plan for two strong adults to move the mattress. Also, without lifting straps to fold the bed like a taco, you may never get it through your door or up any stairs. My husband once got creative, tied the mattress with ropes like a gyro into a cylindrical shape, and pushed it end-over-end up the stairs. But that was a near-disaster for our chandelier, so I don’t recommend that. Firmness. Children’s growing spines require a firmer sleep surface, so a best bet is a basic coil spring mattress. And whether you prefer firmer or not, if you sleep on your side you’ll require a softer bed to avoid waking up with back pain. Allergies. There are individuals out there allergic to wool and latex. Is this is the case for your family, you can opt for for the Intellibed. My friend Sarah the Healthy Home Economist raves about this one, despite it not being 100% organic. To save your mattress, a good waterproof cover is necessary. Your best option is a trusted chemical free company such as those listed below, but a BPA and Vinyl-free mattress cover like this one is another option that’s slightly less expensive. Also vacuuming the mattress from time to time is recommended. Remember that mattress covers, sheets, and pillows are also sources of chemicals, to a lesser degree. Companies that sell natural/ organic beds also have bed accessories. However, we get our organic sheet sets at Target, and a great alternative to organic cotton or latex pillows is a Buckwheat Hull Pillow. The sound it makes when you move around takes some getting used to, but for some, it’s the best night sleep they’ve had. If you are just not in a position to buy a new bed, you still have options. You can purchase a full zip-around cover to minimize off-gassing, and get a latex / organic wool mattress topper for your current bed. There are a handful of companies out there that will disclose their manufacturing process, mostly small companies that specifically manufacture organic and natural furniture and mattresses. Those manufacturers do have additional supply costs for organic cotton, organic wool, and natural latex made without fillers, which you’ll see reflected in the higher price tag. Savvy Rest offers organic mattresses, beds and accessories, and can be found in mattress stores and prices vary, although they have a contract with retailers not to go below a certain sale price. Savvy Rest discloses the source of their latex on their website so consumers can be confident their product. This is the line of mattress available to retailers that Wilson chose for his store. My Green Mattress is a small company out of Chicago that produces completely organic mattresses, bedding, mattress toppers and bed frames. They have turned down retail sales and sell direct. Spring coil twin beds start at $494 shipped, but they regularly have $50- $75 off coupons on their facebook page several times a year (usually on holiday weekends). I have had two of their mattresses for 4 years now that are still going strong and plan on buying another. What’s great about their spring coil mattresses is that they are double-sided so can be flipped. Not many companies still make them that way. Pure Talaylay Bliss, also known as Latex Bliss, can be found in some retail stores. They have a natural line starting at $1499, and you can search products and prices on their website. The company’s claims are based in the Talaylay. They make no claims about being “organic” but claim to be free of latex additives, low levels of chlorides and formaldehyde, and meet OEKO-TEX standards Level 1. On the other hand, my husband and I have been sleeping on this brand for 4 years and it nver had a smell (except the smell of latex the first day we got it) so I’m mixed on this one. We are still very happy with it, and it’s even held up against my 3 kids jumping on it. However, we will be choosing Savvy Rest because a) it’s actually organic, and b) you can open up the mattress to rearrange the layers depending on preferences instead of replacing an entire bed, you can order a layer of latex. Intellibed. While I don’t endorse this one, if you are just not willing to give up the Sleep Number Comfort to go full green, this is your best bet. I’ll let you read Sarash’s reviews on this one here and here. Sleeping Organic twin natural latex beds begin at $795 and work up to $2350. Organic latex beds begin at $895 and works its way up to $3295 with their California King. Their website has reviews listed here. They also offer latex mattress toppers. **Pricing as of 11/2016, based on the websites. This article has some options and a bit more information on safe mattresses and alternative options such as wrapping an infant bed. One thing I’ve found is that a good number of Americans totally underestimate just how vital sleep actually is. Our bodies depend on solid sleep in order to repair damaged tissue, rejuvenate our cells, and grow muscle – along with a number of other processes. Plus, anyone who has ever had to deal with a night of restless sleep knows exactly how agonizing it can be to wake up in the morning, get your day started, and be able to concentrate on the daily tasks you have to concentrate on. While I was doing research for a recent article, I was half-way shocked to find out that the CDC has put out data proving that one-third of adults don’t sleep anywhere near as well as they ought to. It’s ridiculous how bad we’re harming our bodies when we don’t get enough quality sleep.